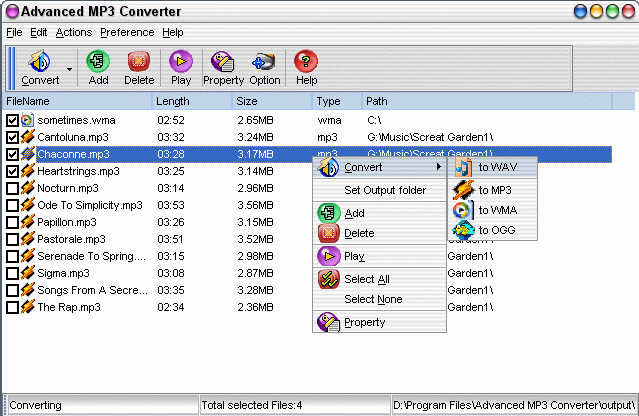 Advanced MP3 Converter converts audio formats such as MP3, WMA, WAV, OGG, APE, MPC, AAC etc from one format to another. Audio format conversion is performed directly without any temporary files, and thus enables high converting speed and economy of hard disk resource. It supports editing MP3 id3 v1 , MP3 id3 v2 tag, APE tag. WMA tag also supported. Automatic volume normalization when converting, It best for burning own burning own high quality CD's. 512 MB RAM or more. Intel Pentium or compatible processor. Support Apple Lossless Audio codec. Advanced Mp3 Converter uses most modern and fast audio codecs, it internally supports WMA 9 format: WMA 9 with constant bitrate, quality based WMA 9 format with variable bitrate, two-pass bitrate based WMA 9 format with variable bitrate and WMA 9 Lossless format, which allows you to store your digital audio with best qualty. For MP3 encoding it uses fast LAME encoder 3.93, for OGG encoding it uses latest Vorbis SDK updates. for APE encoding it use lasted version 3.99. Advanced Mp3 Converter supports dragging and dropping files from the Explorer or File Manager into an open session of Advanced Mp3 Converter. Files may be selected from the File Manager (multiple files may be selected) and dragged into the Advanced Mp3 Converter window. Application allows you to create (or append to) Winamp play lists(*.pls,*.m3u). Build-in mini and pretty player, Equalizer also supported.